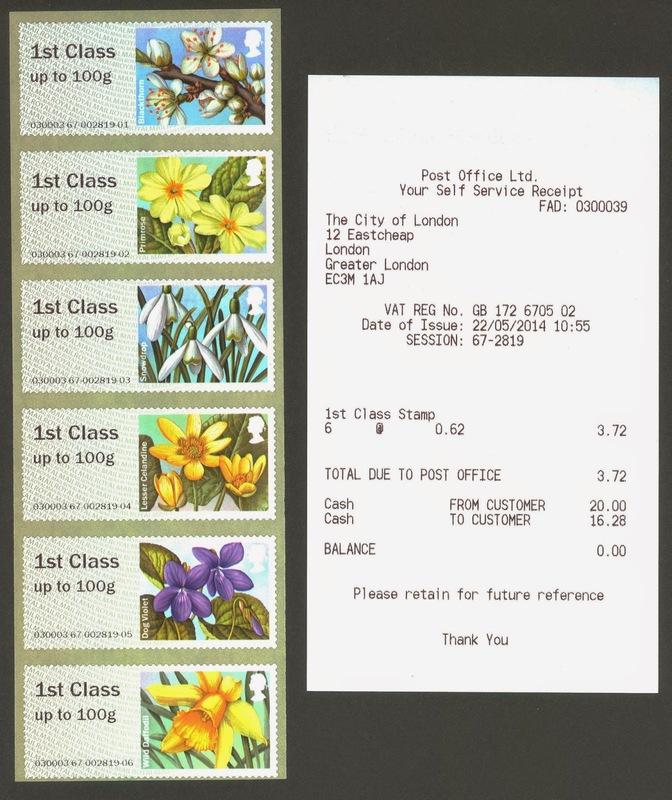 There have been two reports of Spring Blooms stamps loaded into NCR machines. Cambridge is said to have had only 2 rolls. Thanks to Doug for this collectors set of 6 x 1st Spring Blooms from the Eastcheap NCR machine. Royal Mail are unlikely to produce any 2013 or earlier special sets on NCR-size rolls, although the Union Flag should appear in due course. The Robin may appear, but the final 2014 set is Winter Greenery which may be used instead of the Robin. No announcements have yet been made. And on that subject, I do not expect there to be any announcement from Royal Mail about the introduction of Spring Blooms to the NCR machines: the stamps were issued in February. Royal Mail would have anticipated the extensive roll-out by Post Office Ltd of the NCR machines and accordingly ordered part of the printing to be on NCR-size rolls. Could you please put in a link to where on Ebay these are to be found, like the very helpful link you put in for the Ebay place for finding the 85th Scottish congress with the date errors. I'll do so, but would caution against paying high prices for something which could be quite common during the summer. The next new P and G stamps will not appear until September by which time probably 80% of the Wincor-Machines will have been changed to NCR. Any idea if these are these reprints, or have Wincor version been rewound onto new cores alternatively were two versions manufactured? No details have been provided. Given the long gap in the program between the February issue of these and the September issue of the 2nd Flowers set, and the long-planned introduction of NCR machines in order to vend 2nd class labels, it would be surprising if Royal Mail had not asked Walsall to print some to fit both machines. Getting the balance (of production numbers) right would have been interesting. Printer error. I've got pictures of some Post and Go labels from Wincor machines with a big chunk of the printing missing. New Islington Office (160-161 Upper Street) expected to open 16th June – 2 NCR machines expected. New Wandsworth Office (54-60 Wandsworth High Street) expected to open 7h July – 2 NCR machines expected.